You have your own email servers (also called on-premises servers), and you subscribe to Exchange Online Protection (EOP) for email protection services. You have (or intend to have) mailboxes in two places; some mailboxes in Office 365, and some of your mailboxes are on your organization email servers (also called on-premises servers). Before you get started, make sure you check on your specific scenario in I have my own email servers. How do Office 365 connectors work with my on-premises email servers? 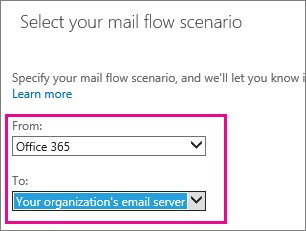 If you have EOP and your own email servers, or if some of your mailboxes are in Office 365 and some are on your email servers, set up connectors to enable mail flow in both directions. You can enable mail flow between Office 365 and any SMTP-based email server, such as Exchange or a third-party email server. 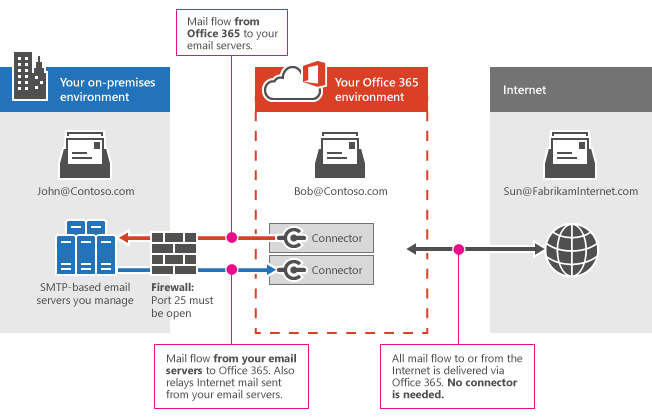 The diagram below shows how connectors in Office 365 (including Exchange Online or EOP) work with your own email servers. When email is sent between John and Bob, connectors are needed. If you have your own email servers and Office 365, you must set up connectors in Office 365. Without connectors, email will not flow between Office 365 and your organization's email servers. How do connectors route mail between Office 365 and my own email server? When you set up Office 365 to accept all email on behalf of your organization, you will point your domain's MX (mail exchange) record to Office 365. To prepare for this mail delivery scenario, you must set up an alternative server (called a "smart host") so that Office 365 can send email to your organization's email server (also called "on-premises server"). To complete the scenario, you might need to configure your email server to accept messages delivered by Office 365. When this connector is set up, Office 365 accepts messages from your organization's email server and send the messages to recipients on your behalf. This recipient could be a mailbox for your organization in Office 365, or it could be a recipient on the Internet. To complete this scenario, you'll also need to configure your email server to send email messages directly to Office 365. This connector enables Office 365 to scan your email for spam and malware, and to enforce compliance requirements such as running data loss prevention policies. When your email server sends all email messages directly to Office 365, your own IP addresses are shielded from being added to a spam block list. To complete the scenario, you might need to configure your email server to send messages to Office 365. This scenario requires two connectors: one from Office 365 to your mail servers, and one to manage mail flow in the opposite direction. Before you start, make sure you have all the information you need, and continue with the instructions until you have set up and validated both connectors. Complete the prerequisites for your email server environment. Part 1: Configure mail to flow from Office 365 to your email server. 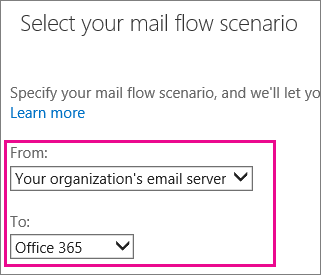 Part 2: Configure mail to flow from your email server to Office 365. Make sure that your on-premises email server is set up and capable of sending and receiving Internet (external) email. Check that your on-premises email server has Transport Layer Security (TLS) enabled, with a valid certification authority-signed (CA-signed) certificate. We recommend that the certificate subject name includes the domain name that matches the primary email server in your organization. Buy a CA-signed digital certificate that matches this description, if necessary. If you want to use certificates for secure communication between Office 365 and your email server, update the connector your email server uses to receive mail. This connector must recognize the right certificate when Office 365 attempts a connection with your server. If you're using Exchange, see Receive Connectors for more information. On the Edge Transport Server or Client Access Server (CAS), configure the default certificate for the Receive connector. Update the TlsCertificateName parameter on the Set-ReceiveConnector cmdlet in the Exchange Management Shell. To learn how to open the Exchange Management Shell in your on-premises Exchange organization, see Open the Exchange Management Shell. Make a note of the name or IP address of your external-facing email server. If you're using Exchange, this is the Fully Qualified Domain Name (FQDN) of your Edge Transport server or CAS that will receive email from Office 365. Make sure that your firewall accepts connections from all Office 365 IP addresses. See Exchange Online IP addresses and URLs for the published IP address ranges. Make a note of an email address for each domain in your organization. You'll need this later to test that your connector is working properly. To set up connectors, you need permissions assigned before you can begin. To check what permissions you need, see the "Office 365 connectors" entry in the Feature permissions in EOP topic. Use a certificate configured with a subject name that matches an accepted domain in Office 365. We recommend that your certificate's common name or subject alternative name matches the primary SMTP domain for your organization. For details, see Prerequisites for your on-premises email environment. Make sure that all your organization sender domains and subdomains are configured as accepted domains in Office 365. For more information about defining accepted domains, see Manage accepted domains in Exchange Online and Enable mail flow for subdomains in Exchange Online. 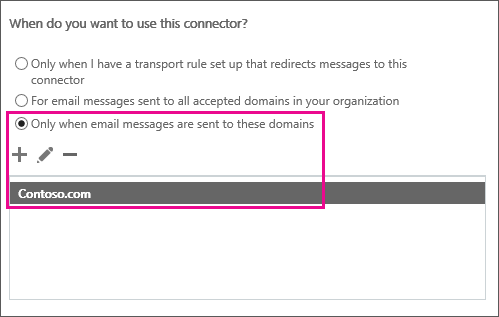 Decide whether you want to use mail flow rules (also known as transport rules) or domain names to deliver mail from Office 365 to your email servers. Most businesses choose to deliver mail for all accepted domains. For more information, see Scenario: Conditional mail routing in Exchange Online. You can set up mail flow rules as described in Mail flow rule actions in Exchange Online. For example, you might want to use mail flow rules with connectors if your mail is currently directed via distribution lists to multiple sites. To create a connector in Office 365, click Admin, and then click Exchange to go to the Exchange admin center. Next, click mail flow, and click connectors. If any connectors already exist for your organization, you can see them listed here. Before you set up a new connector, check any connectors that are already listed here for your organization. For example, if you ran the Exchange Hybrid Configuration wizard, connectors that deliver mail between Office 365 and Exchange Server will be set up already and listed here. You don't need to set them up again, but you can edit them here if you need to. If you don't plan to use the hybrid configuration wizard, or if you're running Exchange Server 2007 or earlier, or if you're running a non-Microsoft SMTP mail server, set up connectors using the wizard. Click Next, and follow the instructions in the wizard. Click the Help or Learn More links if you need more information. The wizard will guide you through setup. At the end, make sure your connector validates. If the connector does not validate, double-click the message displayed to get more information, and see About fixing connector validation errors for help resolving issues. To redirect email flow to Office 365, change the MX (mail exchange) record for your domain. For instructions on how to do this, see Add MX record to route email. Set up a connector from your email server to Office 365. Set up your email server to relay mail to the Internet via Office 365. Once you have completed Part 2, see the instructions at the end to check that your configuration works. To create a connector in Office 365, click Admin, click Exchange, and then to go to the Exchange admin center. Next, click mail flow, and click connectors. If any connectors already exist for your organization, you can see them listed here. Click Next, and follow the instructions in the wizard. Click the Help or Learn More links if you need more information. In particular, see Identifying email from your email server for help configuring certificate or IP address settings for this connector. The wizard will guide you through setup. At the end, save your connector. Next, you must prepare your email server to send mail to Office 365. This enables mail flow from your email servers to the Internet via Office 365. 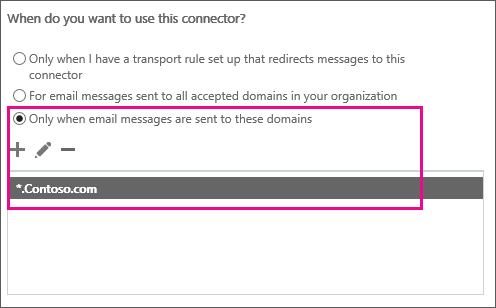 If your on-premises email environment is Microsoft Exchange, you create a Send connector that uses smart host routing to send messages to Office 365. For more information, see Create a Send connector to route outbound email through a smart host . For instructions on how to do this with Exchange Server 2010, see Create an SMTP Send Connector. To create the Send connector in Exchange Server, use the following syntax in the Exchange Management Shell. To learn how to open the Exchange Management Shell in your on-premises Exchange organization, see Open the Exchange Management Shell. In the following procedures, the CloudServicesMailEnabled parameter is available in Exchange 2013 or later. How do I know connectors will route my organization mail correctly? If you have completed all of these steps correctly, all your mail will now be delivered via Office 365. Send email from a mailbox on your email server to an external (Internet) recipient. Send email from an Internet mailbox to a mailbox on your email server. Make sure both emails are received. To change settings for a connector, select the connector you want to edit and then select the edit icon as shown in the following screen shot. The connector wizard opens, and you can make changes to the existing connector settings. While you change the connector settings, Office 365 continues to use the existing connector settings for mail flow. When you save changes to the connector, Office 365 starts using the new settings. Most customers don't need to set up connectors. For those that do, one connector per single mail flow direction is usually enough. But you can also create multiple connectors for a single mail flow direction, such as from Office 365 to your email server (also called on-premises server). Use a connector that exactly matches the recipient domain. Use a connector that applies to all accepted domains. Use wildcard pattern matching. For example, *.contoso.com would match mail.contoso.com as well as sales.contoso.com. In this example, your organization has four accepted domains, contoso.com, sales.contoso.com, fabrikam.com, and contoso.onmicrosoft.com. You have three connectors configured from Office 365 to your organization's email server. For this example, these connectors are known as Connector 1, Connector 2, and Connector 3. Connector 1 is configured for all accepted domains in your organization. The following screen shot shows the connectors wizard screen where you define which domains the connector applies to. In this case, the setting chosen is For email messages sent to all accepted domains in your organization. Connector 2 is set up specifically for your company domain Contoso.com. The following screen shot shows the connectors wizard screen where you define which domains the connector applies to. In this case, the setting chosen is Only when email messages are sent to these domains. For Connector 2, your company domain Contoso.com is specified. Connector 3 is also set up by using the option Only when email messages are sent to these domains. But, instead of the specific domain Contoso.com, the connector uses a wildcard: *.Contoso.com as shown in the following screen shot. john@fabrikam.com, Office 365 selects Connector 1.
john@contoso.com, Office 365 selects Connector 2.
john@sales.contoso.com, Office 365 selects Connector 3.